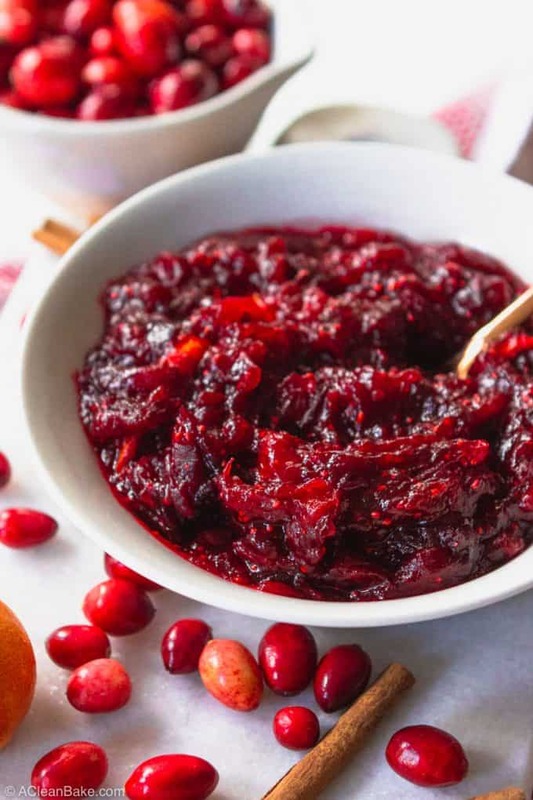 This paleo cranberry sauce is the easiest Thanksgiving dinner side you’ll ever make. It requires only 4 ingredients (plus water) and about 15 minutes of your time. Plus, it is naturally sweetened with maple syrup and orange juice. Don’t stress about the sides this year! Is it just me, or is everyone else prone to overlooking the cranberry sauce when it comes to planning your Thanksgiving feast? First, you lock down your turkey recipe (or, in my case, since I’m only cooking for 3 of us, the turkey breast recipe). Then the sides; this year I’m making green beans, sweet potatoes, and paleo stuffing. About 2 hours before the meal, you remember – OMG! – you forgot the cranberry sauce and the gravy. 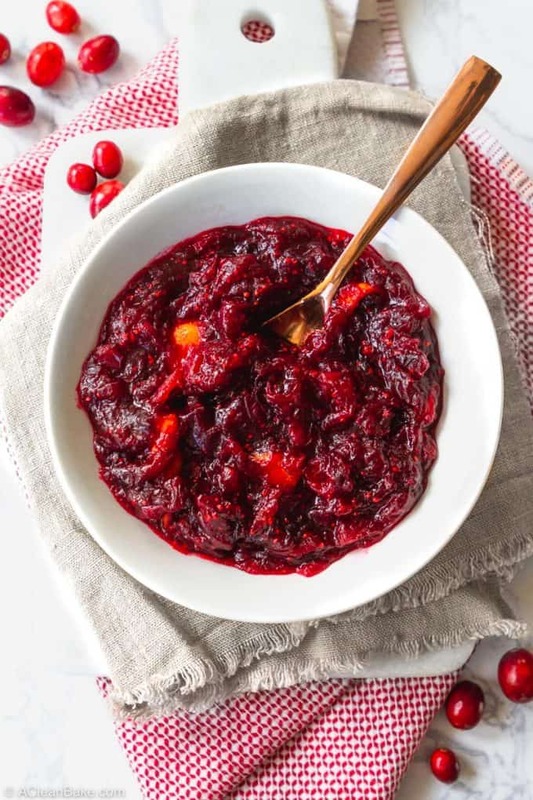 It’s easy to forget that cranberry sauce is an important side dish, and it’s tempting to forego the homemade cranberry sauce in favor of something store bought…or – gasp! – from a can? Please PUT. DOWN. THAT. CAN. OPENER. The absolute last thing you need this week is one more multi-day-prep dish. Don’t worry: the only thing you need to do to prep for this dish is throw a bag or two of fresh cranberries in your cart when you’re shopping for your meal. Add a bag of mandarin oranges, if you don’t already have those at home. 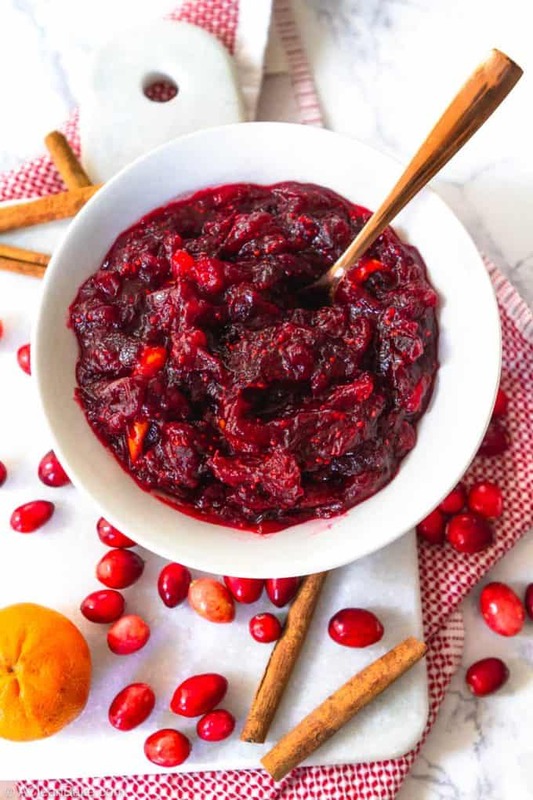 As long as you have all of the necessary ingredients on hand, you can whip up a batch of vegan and paleo cranberry sauce in the 5 minutes before your Thanksgiving guests arrive. See? No fuss! 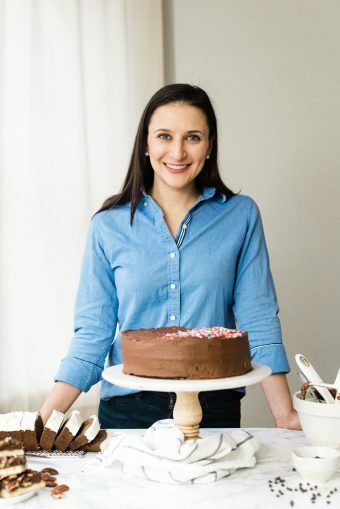 It’s an easy process that requires very little brainpower (so, even if you’re pretty burned out on cooking, you can still pull this off), and just a little bit of effort. Put all of the ingredients in a small saucepan over medium heat. Uncover and stir until the sauce thickens to your preference, about 5-10 minutes. Remember, it will thicken more as it cools. That’s really it. You can serve it immediately, or make is up to a week ahead of time and store it in the fridge or freezer (in an airtight container) until you’re ready to serve it. Obviously, warm it to room temperature before you serve it. The most challenging part of this recipe is making sure you’re stirring frequently, so that the cranberries don’t burn. If you have a little sous chef around who you’re comfortable letting them work around the stove, this would be the perfect dish to enlist their help with. Can I use honey instead of maple syrup? Absolutely. The maple syrup compliments the flavor of the berries really well, but if you want to use honey instead, you can simple replace the maple syrup with 1/3 cup honey. However, if you make this swap, the recipe will no longer be vegan. Can I sweeten this with coconut sugar? I highly recommend using a liquid sweetener (maple syrup, honey, or even agave) in this recipe. But if coconut sugar is all you have on hand, you can use 1/4-1/3 cup in place of the maple syrup in the recipe. 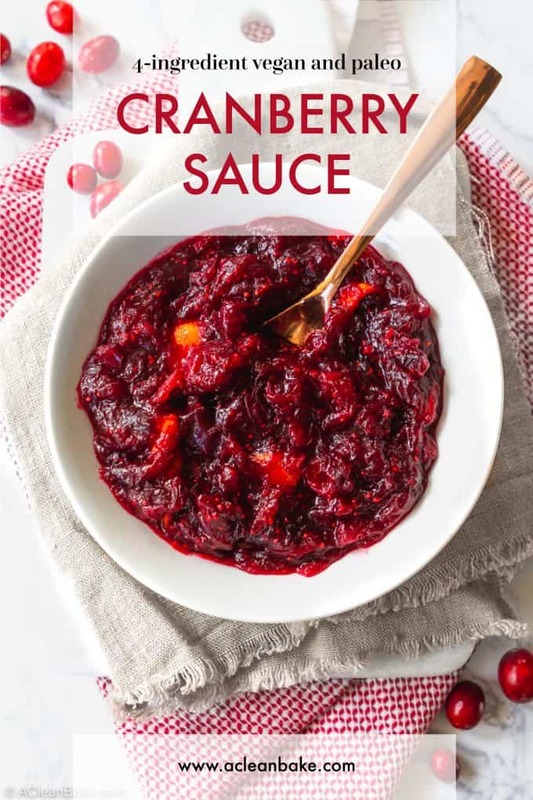 You will also have to add some additional liquid to the recipe to compensate for the liquid that the maple syrup would provide – up to 1/4 cup water, depending on how thick you prefer your cranberry sauce. What do I do if I don’t have a cinnamon stick? Add 1/4 teaspoon ground cinnamon to the sauce. Stir and taste. If you’d like more cinnamon flavor, add another 1/8-1/4 teaspoon of cinnamon. 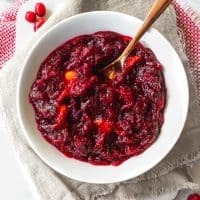 My family favorite cranberry sauce recipe contains orange zest. Where’s the zest? Instead of using the zest of the orange, I use the entire peel. I borrowed this trick from my mother-in-law’s to-do-for cranberry sauce! 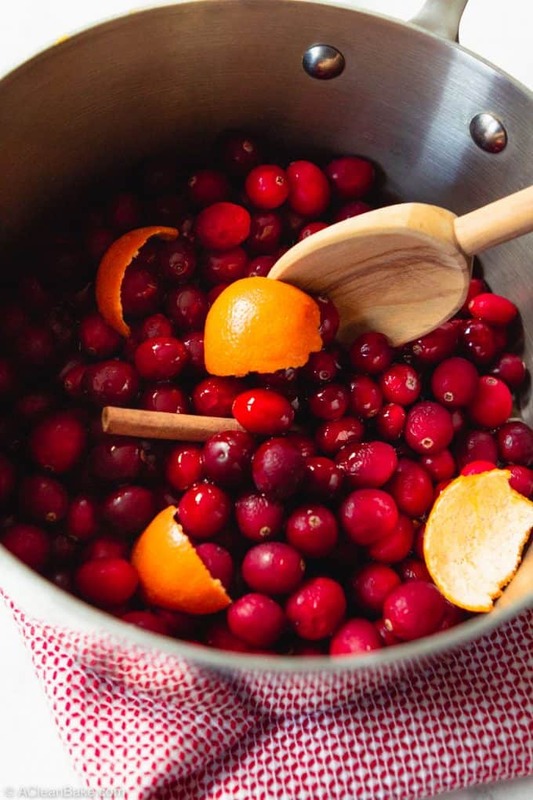 She uses an entire orange: meat, juice, and peel to produce a perfectly flavored and perfectly thick cranberry sauce. The whole peel offers not just the flavorful oils (that’s what you’re going for when you zest an orange), but also the thickening properties of its pectin, a naturally-occurring, vegan thickening compound. Is this a runny sauce or a firmer sauce? I’d say it’s somewhere in the middle. It’s runny enough to provide the moisture you’re looking for when you douse your meal with it, but thick enough that it’s not all going to run off on to the plate. It’s nowhere near the solid consistency of something you’d find in the can though. If you want a thicker sauce, simmer the sauce for longer over low heat (this allows the orange peel to break down and release more pectin, which thickens the sauce), or add an teaspoon of gelatin powder (make sure you dissolve it in a few tablespoons of hot water before you add it to the sauce). Note that if you do use gelatin, the recipe is no longer vegan. How do I make this recipe low-carb, or sugar free? Use this recipe instead. How do I make this Whole30 compliant? Omit the maple syrup and use about 1 cup orange juice (or to taste) to sweeten the sauce instead. Can I make this in the slow cooker or Instant Pot? You can try it in the slow cooker. I’m guessing it will take about 1-2 hours, over low heat. I do not recommend making this in the Instant Pot. 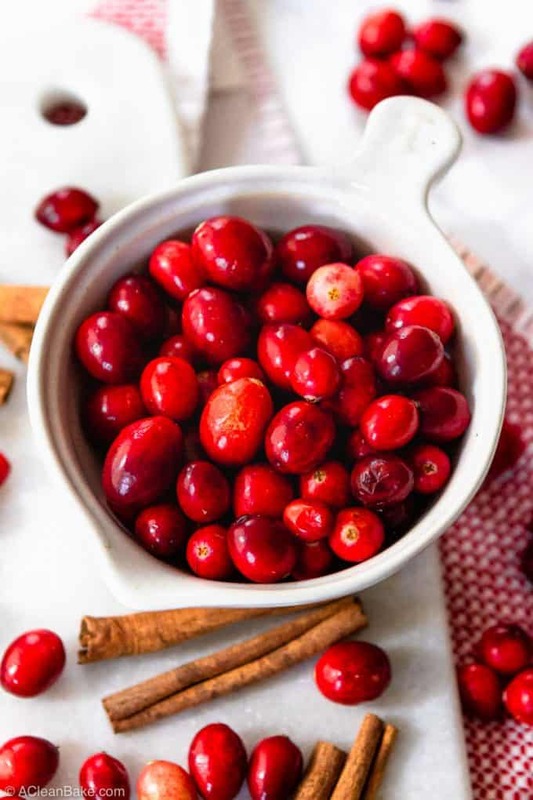 If you love cranberry sauce as much as I do, this stress-free recipe will not disappoint! PPS: If you’re reading this after the big day, and are already thinking about Christmas dinner, most of the recipes linked above are still great for Christmas & Hanukkah , and I have additional paleo recipes for you here. 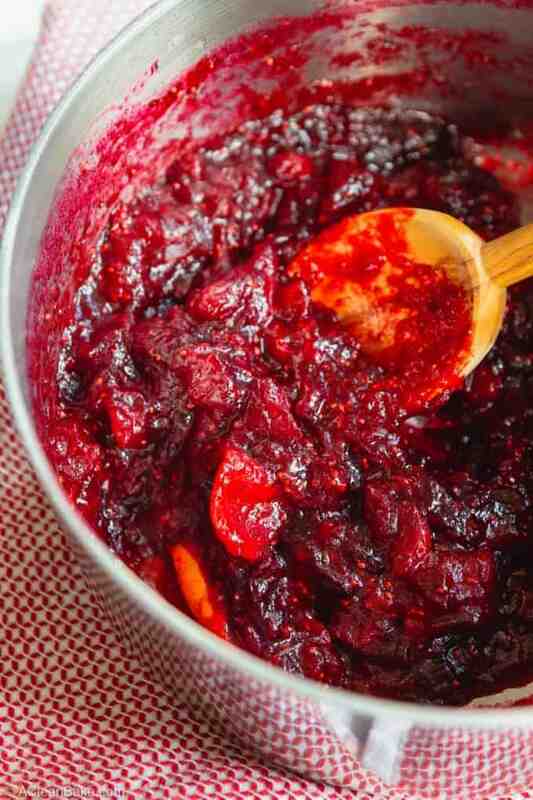 This paleo cranberry sauce is the easiest Thanksgiving dinner side you'll ever make. It requires only 4 ingredients (plus water) and about 15 minutes of your time. Plus, it is naturally sweetened with maple syrup and orange juice. Don't stress about the sides this year! Peel the orange, and cut the peel into 4 pieces. Place peel in a small saucepan on the stove. Juice the orange and put the juice (~1 Tablespoon) in the saucepan. Discard the meat of the orange. Cover and turn on the heat to medium-high. Bring the sauce to a boil, then remove the cover and reduce the heat to medium. Cook, stirring regularly, until cranberries have burst and sauce has thickened (about 5-10 minutes). Remove from heat and allow to cool to room temperature before serving or storing. Optional: remove orange peel before serving (I like to leave it in). You can replace the maple syrup with an equal amount of honey or coconut sugar. If you choose to use coconut sugar, you will also need to add an additional 2-4 tablespoons of water or orange juice (depending on how thin you like your sauce). If you don't have a cinnamon stick on hand, replace it with 1/4 - 1/2 teaspoon ground cinnamon (to taste). This is a medium-thickness sauce. If you want a runnier sauce, simply add a few extra tablespoons of water or orange juice. If you want a thicker sauce, simmer the sauce for longer over low heat (this allows the orange peel to break down and release more pectin, which thickens the sauce), or add an teaspoon of gelatin powder (make sure you dissolve it in a few tablespoons of hot water before you add it to the sauce). Note that if you do use gelatin, the recipe is no longer vegan. To make this recipe Whole30 compliant, omit the maple syrup and use about 1 cup orange juice (or to taste) to sweeten the sauce instead. Cooled cranberry sauce will keep in an airtight container in the refrigerator for up to a week, or in the freezer for up to two months.